Ken St. Andre designed this first teleport solo dungeon with the scorpion-tailed Umslopagaas as proprietor...Adventure on the incredible Trip of the Lion - or, for the faint of heart, the Trip of the Frog. If you have trouble getting enough friends together to play T&T, or if you have only a little time to spend, then the Solo Dungeons are designed for you. 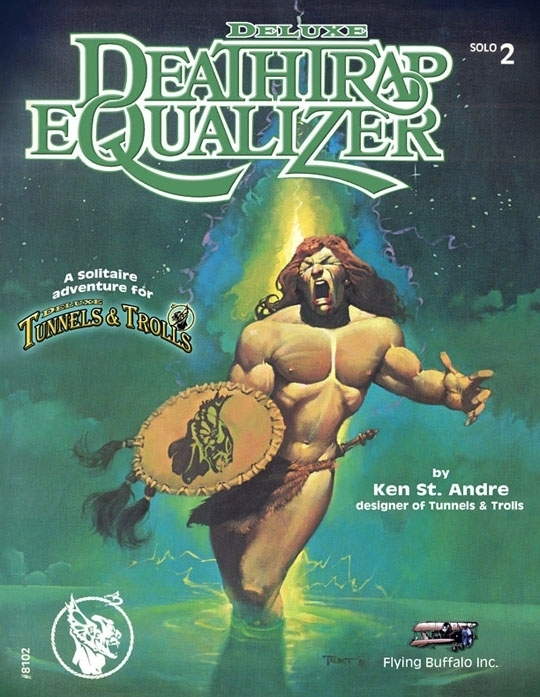 You need only the rules for Tunnels & Trolls, a few six-sided dice, paper, pencil, and this booklet to play. NOTE: I originally posted a scanned version of one of the older versions of this adventure. I have added the new deluxe version updated by Ken with new artwork by Steve Crompton. Both files are included for no extra charge. The new file is the one with 2013 in the title!